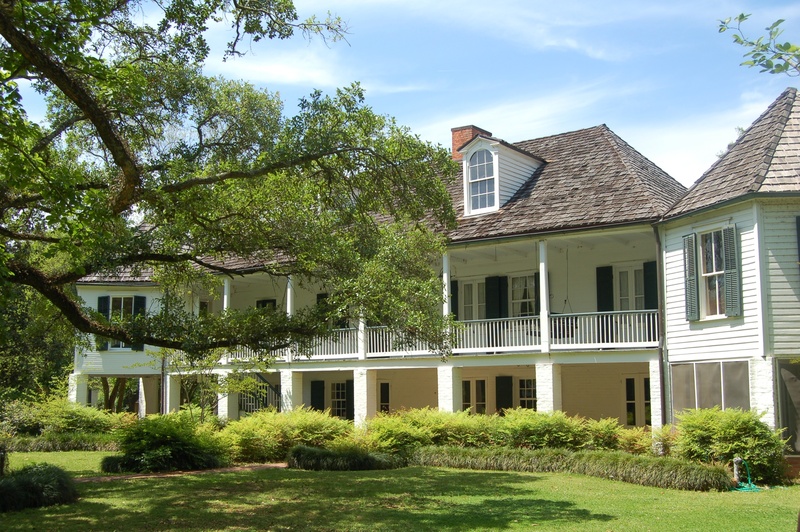 Melrose Plantation is located just outside of Natchitoches, Louisiana. Construction on the main house began in 1832. John Hampton Henry and Carmelite (Cammie) Garrett Henry, bought the property from their heirs in 1899. John Henry died suddenly in 1918. Cammie led the plantation into one of it’s most glorious periods. She was a committed preservationist and patron to the arts, especially literature. During a period known as the “Southern Renassaince,” Cammie hosted a variety of artists who were invited or allowed to stay in quarters behind the big house. She only had 2 conditions: a) they had to work on their craft and b) they had to join her for supper where each artist would report on their work of that day. Lest you think she was merely an observing patron, she was prolific in your own craft of making quilts and other sewing projects. She would frequently have all the guests at the table sign the white cloth tablecloth in pen, then she would embroider over each name to preserve it. Many of her intricate sewing projects remain, including a number of those embroidered tablecloths. Cammie would report on her projects along with all the other artists. Those familiar with the Civil War and post-Civil War South will certainly know the name Clementine Hunter. Cammie employed her as the cook. Clementine’s family moved to Melrose from another plantation where they were sharecroppers. She was about 12 and worked in the fields of Melrose. 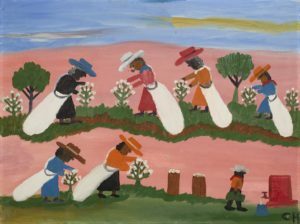 Later she became a housekeeper, but her job as the cook that gave her the opportunity she’s most known for – painting. She discovered some discarded paints left behind by one of those artists hosted by Cammie. She had no formal education and didn’t know how to read or write. She taught herself to paint though and became prolific (today there are some 6000 pieces of her art in the world). In the early 1940’s an artist showed up who would chronicle life at Melrose. His name was Francois Mignon and he claimed to be from Paris, France. Turns out he was Frank Mineah from Courtland, New York. But let’s not let truthful details spoil a grand story, shall we. He arrived at Melrose for a 6-week stay taking full advantage of Cammie’s hospitality. He stayed 32 years! Daily he would journal about life at Melrose. Thousands of pages. The problem is he romanticized life at Melrose and historians have had a difficult time separating fact from the fiction of Francois’ mind. Cammie died in 1948, but Francois continued to live at Melrose until 1970. However, without Francois Melrose may not have been preserved or restored so he provided a valuable service outside of his exaggerated daily journals. Over at the Year Of The Peer podcast, Leo Bottary and I regularly review to our tagline, “who you surround yourself with matters.” Cammie began to illustrate that point back in 1918 after her husband’s death. Cammie hosted artists of all types as a patron. Her 2-rule imposition may have deterred some, but she was still able to surround herself – and the other artists – with people pursuing their craft. They were all creative. They were all working on their craft every day. Individually they spent time alone in their pursuit. These guests of Melrose, enjoying the hospitality and support of Cammie, likely got to know one another quite well. Creative people enjoy each other’s company. They’re interested in what the others are doing. The process of being creative is a tie that binds. Multiple writers would be hosted at the same time. But so would other artisans. It didn’t matter if the person was a painter, writer or sculptor. Or like Cammie, a person using fabric, thread, and cloth-based artistry. The “what” of your pursuit didn’t matter. The creation did. Diverse pursuits and points-of-view likely fueled greater creativity as each artist was seeing and understanding the projects of the others. We’ve no way of knowing the full impact a painter may have had on a writer. Different craft. Different pursuit. But value in helping each artist consider and perhaps apply lessons learned by other guests to their own work. Each evening as the guests made their way to the big house and sat around a large table to enjoy a meal together, Cammie had them inform the rest of the group about their progress that day. That daily check-in propelled greater output and higher accomplishment as each guest would certainly feel the positive pressure to have done something productive that day. The group was waiting to hear the news of progress. You certainly wouldn’t want to disappoint them. Or your host. Sharing those experiences of working on their art likely brought daily insights on how each of them might apply things they would have never considered on their own. Hearing others talk of their work compels all of us to think of their experience in the framework of what we’re doing. We’ll all heard somebody tell us something they’re doing which sparked us to say, “That’s a great idea!” I’m rather certain that happened around Cammie’s table. Cammie wasn’t sitting at the head of the table simply grilling each guest about their work. She was doing her own work and reporting on it. While she was the patron and host, at the table in the daily discussion, she was part of the group. Her work mattered to her just as much as anybody else. The guests wanted to hear of her progress as much as anybody. Her wealth and staus didn’t matter as they reported their progress. She was an artist like the rest. Nothing divided the group. The power was in the entire group and what each of them could contribute to the whole. This is an early 1900 example of THE PEER ADVANTAGE. Peer advantage goes back to the beginning of time itself. According to the Book of Genesis Adam and Eve collaborated to do the work God gave them. Mostly, God took care of them forbidding them of just one tree – the tree of knowledge of good and evil. Well, Eve was tempted and she influenced Adam…and they both sinned. So it goes with the people who surround us — they influence us for good, or evil. The good news is that we can choose. Choosing is hard though, as we saw in the review of the book, The Third Opinion. It’s not necessarily best to rely on luck, happenstance or coincidence. Many business leaders rely on organic relationships to provide their inner circle of insight. That’s about as reliable as how we did it as kids in the neighborhood. If Johnny next door was a hellion bent on trouble, he was likely going to get the rest of us in trouble as we foolishly followed him. But if Suzy lived next door and was a well-behaved, good student, then we likely all stayed out of trouble if Suzy had any leadership influence on our group. When I walked through the Melrose Plantation big house and looked around the room where the nightly suppers were held, it was easy to envision the conversation of these artists with their host, Cammie. I could imagine how some evenings a few may not have walked to the big house as briskly as other days because perhaps their day wasn’t as productive as they hoped. And they knew they’d have to divulge today’s difficulties to the group. But these were other artists – their peers. I rather suspect there was tremendous support and encouragement rather than harsh judgment. At least I’d like to think so. And given how long some of the artists stayed, I suspect I’m right. Which led me to wonder about the artists who may have bailed out, unwilling to withstand the rigors of accountability. Unwilling to push themselves harder to grow, improve and transform. Intuition tells me the ones who stayed benefited while the cowardly likely never discovered their best work. So it goes with you and me. We can learn (and replicate) these experiences for our own growth, improvement and transformation. Or we can cower at the thought of sitting with a group of peers who are committed to nudging us toward higher performance. People willing to let us serve them the same way. It’s been 100 years since Cammie lost her husband and began her solo efforts to restore and transform Melrose. But she wasn’t alone at all. She was surrounded each day with artists who came there to devote themselves to their craft. And each evening she was surrounded by these creative people as together they shared what they had done and what they learned that day. It’s a lesson for us all. A lesson we’ll only benefit from if we seize The Peer Advantage like Cammie did.